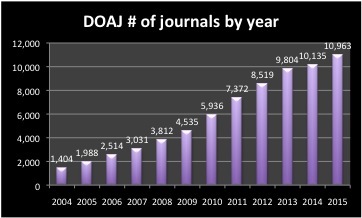 After a year or so of slower growth at DOAJ to accommodate back-end technical work and a new get-tough policy on journal inclusion, robust DOAJ growth is back on track. In the last quarter of 2015, DOAJ added a total of 384 titles or more than 4 titles per day for a year-end total of 10,963 journals. 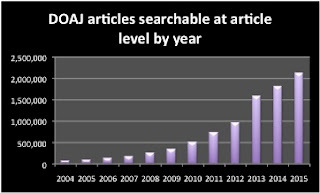 The number of articles searchable at the article level grew by over 300,000 in 2015 for a year-end total of over 2.1 million. 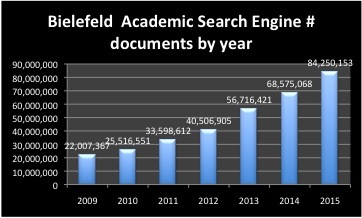 The Bielefeld Academic Search Engine figures demonstrate the overall growth of (mostly) open access repositories, adding more than 15 million documents in 2015 for a total of more than 84 million and adding 671 content providers for a total of just under 4 thousand content providers. Both document growth and content provider growth at BASE reflects greater than 20% growth for 2015, a particularly impressive number given that percentage growth tends to favour newer, smaller initiatives such as the SCOAP3 repository which had the highest growth by percentage in 2015, more than doubling to over 8,000 articles in 2015. Although not all the documents available via a BASE search are open access, the more than 3.7 million items now available for free from PubMedCentral alone is just one indication of robust growth in open access repositories. The Internet Archive now has more than 8.8 million texts. 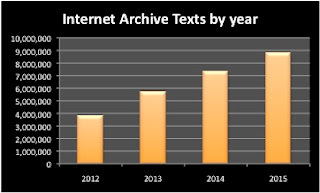 Perhaps even more impressive is that over 8 million of the texts made available by the Internet Archive and Open Library are fully accessible and in the public domain! 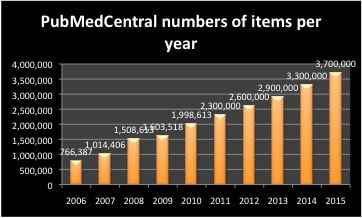 Following are a few charts to illustrate the ongoing amazing growth of open access. To sum up, only one resolution is recommended for all the people behind the thousands of open access journals, repositories and other services for 2016: keep up the good work! 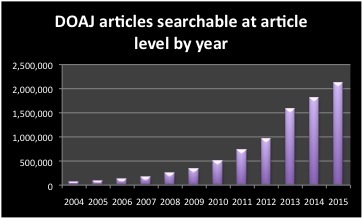 Open data is available through the Dramatic Growth of Open Access dataverse. For previous posts see the Dramatic Growth of Open Access series.